ANDREW BOSTOM’S SERIES: ANTI-SEMITISM IN ISLAMIC TEXTS, THE HADITHS…….. – The Tundra Tabloids……. Mirrored here from the GATES OF VIENNA: Several years ago Andrew Bostom published a comprehensive survey of antisemitism as expressed in the Hadith and the sira of Muhammad. The article is unfortunately no longer available online, so the author has kindly sent us the full text. This is the first of four installments. The contemporary pronouncements of the Islamic Center of Cleveland’s clerical “Imamate”—Fawaz Damra and his (transient) replacement Ahmed Alzaree—illustrate an ancient, but continuous tradition of anti-Jewish incitement by Islam’s “popular preachers,” very much alive today. And the historical treatment of Jews in Muslim societies—chronic oppression, punctuated by outbursts of mass anti-Jewish violence, forced conversion to Islam, or expulsion—has been consistent with such sacralized religious bigotry. Promoters of modern jihad genocide from the former Mufti of Jerusalem, Hajj Amin el-Husseini, to contemporary Hamas clerics, have repeatedly invoked Islam’s Jew-exterminating eschatology. Jews are represented in the darkest colors. Convinced by the clear testimony of their books that Mohammed was the true prophet, they refused to convert, out of envy, jealousy and national particularism, even out of private interest. 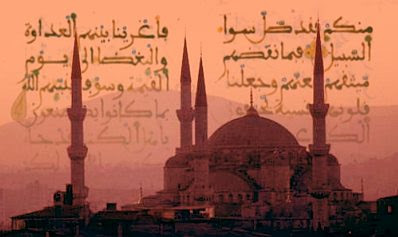 They have falsified their sacred books and do not apply the laws of God; nevertheless, they pursued Mohammed with their raillery and their oaths, and harassed him with questions, an enterprise that turned to their own confusion and merely corroborated the authenticity of the supernatural science of the prophet. From words they moved to action: sorcery, poisoning, assassination held no scruples for them. Hartwig Hirschfeld’s detailed analyses of Muhammad’s interactions with the Jews of Medina as depicted in the earliest pious Muslim biographies of Muhammad (sira; sirat) describes the “mutual disappointment” that characterized their relationship, and the predictably disastrous results for the Jews. The Jews, for their part, were singularly disappointed in their expectations. The way in which Muhammad understood revelation, his ignorance and his clumsiness in religious questions in no way encouraged them to greet him as their Messiah. He tried at first to win them over to his teachings by sweetness and persuasion; they replied by posing once again the questions that they had already asked him; his answers, filled with gross errors, provoked their laughter and mockery. From this, of course, resulted a deep hostility between Muhammad and the Jews, whose only crime was to pass a severe judgment on the enterprise of this Arab who styled himself “God’s prophet” and to find his conduct ridiculous, his knowledge false, and his regulations thoughtless. This judgment, which was well founded, was nevertheless politically incorrect, and the consequences thereof inevitably would prove to be disastrous for a minority that lacked direction or cohesion. Muhammad’s failures or incomplete successes were consistently recompensed by murderous attacks on the Jews. Thus Muhammad developed a penchant for assassinating individual Jews, and destroying Jewish communities—by expropriation and expulsion (Banu Quaynuqa and Nadir), or massacring their men, and enslaving their women and children (Banu Qurayza). Subsequently, in the case of the Khaybar Jews, Muhammad had the male leadership killed, and plundered their riches. The terrorized Khaybar survivors—industrious Jewish farmers—became prototype subjugated dhimmis whose productivity was extracted by the Muslims as a form of permanent booty. And according to the Muslim sources, even this tenuous vassalage was arbitrarily terminated within a decade of Muhammad’s death when Caliph Umar expelled the Jews of Khaybar. Muhammad’s brutal conquest and subjugation of the Khaybar Jews, and their subsequent expulsion by one of his companions, the (second) “Rightly Guided” Caliph Umar, epitomize permanent, archetypal behavior patterns Islamic Law deemed appropriate to Muslim interactions with Jews. Historical and contemporary examples are briefly adduced to illustrate the ongoing relevance of archetypes from the hadith and sira as sources of Islamic antisemitism, past and present. Fawaz Damra , the former Imam of the Islamic Center of Cleveland, was touted as a promoter of interfaith dialogue even after  evidence of his participation in fundraising events for the terrorist group Palestinian Islamic Jihad (PIJ) , was produced, along with a videotape of the Imam telling a crowd of Muslim supporters in 1991  that they should aim “…a rifle at the first and last enemy of the Islamic nation, and that is the sons of monkeys and pigs, the Jews.” Convicted in 2004 for lying to immigration officials about his links to the PIJ, Damra, who was born in Nablus in 1961, was subsequently deported  back to the West Bank in January 2007. Thus the blatant Jew-hatred expressed by Damra and reiterated (in tandem with anti-Christian motifs) by Alzaree—this erstwhile “Imamate of Cleveland”—was fully sanctioned by—indeed they were merely quoting directly from—the core religious texts of Islam, i.e. the Qur’an, hadith, and early Muslim biographies of Muhammad. The Qur’an, of course became a mine of anti-Jewish passages. The hadith did not lag behind. Popular preachers used and embellished such material. The modern pronouncements of Cleveland’s clerical “Imamate”—Damra and Alzaree—reflect an ancient, but continuous tradition of anti-Jewish incitement by Islam’s “popular preachers,” very much alive today. And the historical treatment of Jews in Muslim societies—chronic oppression, punctuated by outbursts of mass anti-Jewish violence, forced conversion to Islam, or expulsion —has been consistent with such sacralized religious bigotry. Promoters of modern jihad genocide have repeatedly invoked Islam’s Jew-exterminating eschatology. Hajj Amin el-Husseini, ex-Mufti of Jerusalem, and Muslim jihadist, who became, additionally, a full-fledged Nazi collaborator and ideologue in his endeavors to abort a Jewish homeland, and destroy world Jewry , composed a 1943 recruitment pamphlet for Balkan Muslims entitled, “Islam and the Jews.” This incendiary document was rife with antisemitic verses from the Qur’an, as well as Jew hating motifs from the hadith, and concluded with the apocalyptic canonical hadith  describing the Jews’ annihilation. Forty-five years later the same hadith  was incorporated into the 1988 Hamas Charter, making clear its own aspirations for Jew annihilation. Sheer ignorance of this history and theology are pathognomonic of much larger and more dangerous phenomena: the often willful, craven failure to examine and understand the living legacy of Islam’s foundational anti-Jewish animus, or acknowledge the depth of Jew hatred that pervades contemporary Islam’s clerical leadership, including within major Muslim communities of the United States. Having earlier described the antisemitic motifs in the Qur’an , as well as their historical manifestations across space and time, the current paper examines in complementary fashion, the antisemitic motifs in the hadith, and earliest pious Muslim biographies of Muhammad, or sira. As early as the first century A.H.[the 7th century] the following aphorism was pronounced: “The Sunna can dispense with the Qur’an, but not the Qur’an with the Sunna”. Proceeding to still further lengths, some Muslims assert that “in controversial matters, the Sunna overrules the authority of the Qur’an, but not vice versa”…all admit the Sunna completes and explains it [the Qur’an]. In addition to giving information about religious duties, law and everyday practice, they contain a considerable amount of biographical and other material. Nothing is too unimportant to form a valid topic for tradition. Guidance is given even on the most intimate matters of personal life. The compilers of Tradition seem to have had a keen desire to leave nothing to chance, so guidance is to be found on almost every conceivable subject. Alternatively, Schacht, a legal scholar, urged that these deconstructed “materials” be re-evaluated in their real context, i.e., the evolution of Islamic law, especially during the time of al-Shafi’i (d. 820; after whom the Shafi’ite school of Islamic jurisprudence was named). Sixty years earlier Goldziher had suggested more broadly that although ahistorical, the hadith reflected important aspects of social and religious development during the first two centuries after the advent of Islam. In the absence of authentic evidence it would indeed be rash to attempt to express the most tentative opinion as to which parts of the hadith are the oldest original material, or even as to which of them date back to the generations immediately following the Prophet’s death. Closer acquaintance with the vast stock of hadiths induces skeptical caution rather than optimistic trust regarding the material brought together in the carefully compiled collections. The conception of Goldziher provides a useful framework for an examination of the anti-Jewish motifs in the hadith. As soon as one renounces using the hadiths as absolutely sure and trustworthy documentation, it is evidently vain to try to take account of the value judgments that Muslim criticism emits regarding any isolated tradition, any collection, or the individual credibility of any traditionalist. Therefore I have been very wide-ranging in making use of documents and the “six books”, as well as of the Musnad by Ahmed ibn Hanbal and the Muwatta by Mālik, not forgetting the commentaries to which I was able to have access, Kastalāni on Buhārī, Nawawi on Muslim, and Zurkāni on the Muwatta. Ibn Sa’d’s Tabakāt and Tabarī’s Tafsīr have also been consulted. It would no doubt have been possible and even desirable to prolong this promenade through the vast fields of the hadith. The remainder of this discussion of antisemitism in the hadith relies upon the themes developed by Vajda, amplified with excerpts from the canonical hadith, and other Traditions, themselves. The prophet also forbids as a Jewish custom the qaza (partial removal of the hair). Almost always it is recommended to dye the hair in contrast to the Jews, (or to Jews and Christians). The same Companion found himself implicated in an analogous incident after the expedition of al’Muraysi in year 5 [after the Hijra, i.e., 622]. The partial restraint of the Muslims, permitting them the satisfaction of their concupiscence without compromising the hope for ransoming the captives, was approved by the prophet, with the same motive as in the preceding hadith. But when Abū Sa’īd wanted to sell a young girl from the booty, a Jew observed at the market that she was certainly pregnant by him; the Muslim assured him that he had practiced ‘azl, to which the Jew replied that it was an attenuated form of coitus. Informed of this discussion, the prophet could only denounce the lies of the Jews. The frankly reproving attitude of the Jews toward the sexual dissipation of the Arabs may be illustrated by many Talmudic texts. They found conjugal relations during the day repugnant, at least unless they were invisible. The indecencies committed in the course of the act implied physical infirmities for any child: muteness, deafness, blindness, paralysis. Onanism was severely reproved. Another tradition (‘Bāda b. al’Sāmit) recounts that in following funerals, the prophet had the habit of standing until the dead person was put in his tomb. One day a haber [rabbi] passed and told him that the Jews did likewise, at which Mohammed invited those attending to sit down so as not to do as the Jews. A hadith that was widespread relates that during his agony the prophet cursed the Jews and Christians who had taken the tombs of their prophets as sites of worship. When the prophet was taken by an attack, he threw a hamīsa (a sort of robe) over his face; when he came around, we lifted him while he said: ‘May God curse the Jews and the Christians, they have taken the tombs of their prophets for sites of worship’ (Aysha adds: ‘he put them on guard [Muslims] against similar practices’). Elsewhere, one finds this curse without the tale that frames it, Abũ ‘Bayda relates it as the prophet’s last recommendation, at the same time as the order to expel the Jews from the Arabian peninsula. A hadith disapproves of Muslims who salute each other by making a sign with their fingers like the Jews, or with the hand like the Christians. Aisha did not like her protégé Masrūq to put his hands on his hips for, she said, only the Jews do that. Raising the hands in prayer is a Jewish gesture. One should not sway (nawadān) while praying, as the Jews do. …the Jews knew very well that it was Mohammed who should accomplish the prediction of their books. If, then, they did not follow him, this was not out of ignorance but out of jealousy and national particularism. It is impossible for a real incident to be the basis of this group of anecdotes, which are mutually irreconcilable. But it is also probable that they were born of the desire to legitimate a governing arrangement whose practical application must have suffered some difficulties in conquered countries, where even the most elementary relations were daily making the new masters confront a significant non-Muslim population. 12. Mark Durie. “Isa, the Muslim Jesus.” In, Robert Spencer, editor, The Myth of Islamic Tolerance, Prometheus Books, Amherst, New York, 2005, pp. 541-555. Narrated Abu Hurayrah: The Prophet (peace be upon him) said: There is no prophet between me and him, that is, Jesus (peace be upon him). He will descent (to the earth). When you see him, recognize him: a man of medium height, reddish fair, wearing two light yellow garments, looking as if drops were falling down from his head though it will not be wet. He will fight the people for the cause of Islam. He will break the cross, kill swine, and abolish jizyah. Allah will perish all religions except Islam. He will destroy the Antichrist and will live on the earth for forty years and then he will die. The Muslims will pray over him. 16. Sahih Muslim Book 041, Number 6985: Abu Huraira reported Allah’s Messenger (may peace be upon him) as saying: The last hour would not come unless the Muslims will fight against the Jews and the Muslims would kill them until the Jews would hide themselves behind a stone or a tree and a stone or a tree would say: Muslim, or the servant of Allah, there is a Jew behind me; come and kill him; but the tree Gharqad would not say, for it is the tree of the Jews. 17. “The Covenant of the Islamic Resistance Movement – Hamas.” Middle East Media Research Institute. Special Dispatch Series, No. 1092. February 14, 2006. 18. Samau’al Al-Maghribi. “Ifham Al-Yahud.” [“Silencing the Jews.”] Edited and Translated by Moshe Perlmann. Proceedings of the American Academy for Jewish Research, Vol. 32, 1964, p. 19. 19. Moshe Perlmann, “Eleventh Century Andalusian Authors on the Jews of Granada” Proceedings of the American Academy for Jewish Research, 1948-49, Vol. 18, pp. 269-290. 20. Perlmann, “Eleventh Century Andalusian Authors on the Jews of Granada,” p.284; Reinhart Dozy. Spanish Islam: A History of the Muslims in Spain, Translated by Francis Griffin Stokes, London, 1915 (reissued by Kessinger Publishing), p. 653. 22. Andrew G. Bostom. The Legacy of Islamic Antisemitism: From Sacred Texts to Solemn History. Prometheus Books, Amherst, N.Y., 2008, 768 pp. 23. Jennie Lebel. The Mufti of Jerusalem Haj-Amin el-Husseini and National Socialism. Cigoja Stampa, Belgrade, Serbia, 2007. English translation by Paul Munch, 373 pp. 28. J. Robson. “Hadith”. Edited by P. Bearman, Th. Biaqnquis, C.E. Bosworth, E. van Donzel, and W.P. Heinrichs, Brill, 2006, Brill Online; J. Robson. “Tradition, The Second Foundation of Islam”, Muslim World, 1951, Vol. 41, pp. 22, 24. 30]Robson. “Hadith”; Robson. “Tradition”, p.24. 31. H. Lammens. Islam: Beliefs and Institutions, (reprint) New Delhi, 2002, p. 69. 33. Robson. “Tradition”, p. 31. 36. Robson in “Hadith” and “Traditions, pp. 25-30. 38. Joseph Schacht. “A Revaluation of Islamic Traditions”, Journal of the Royal Asiatic Society, 1949, pp. 143-154. Re-published in, Ibn Warraq (editor), The Quest for the Historical Muhammad, Amherst, New York, 2000, pp. 358-367. 41. Goldziher, Muslim Studies., Vol. 2, pp. 18-19. 42. Georges Vajda. “Juifs et Musulmans Selon Le Hadit”, Journal Asiatique, 1937, Vol. 229, pp. 57-127. A first time English translation of this essay, in full, is provided in The Legacy of Islamic Antisemitism, pp. 235-260. 43]Vajda. “Juifs et Musulmans Selon Le Hadit”, p. 61. 48. Ibid., pp. 75-81; Sahih Bukhari Volume 2, Book 23, Number 376; Sahih Muslim Book 004, Number 2029. 49. Vajda. “Juifs et Musulmans Selon Le Hadit,” p. 78. Previous Post Previous Post UK JUDGE PONDERS HOW COULD A TERRORIST KICKED OUT OF FRANCE FIND REFUGE IN THE UK……..
Next Post Next Post STATIST EU DIRECTIVES FORCING FINNISH EGG PRODUCERS OUT OF BUSINESS, LEADS TO EGG SHORTAGES IN PARTS OF FINLAND…….